Australian artist Katalyst shows how the land down under gets down with a high-caliber album of varying musical styles. With the help of guest vocalists and MCs, What’s Happening combines hip-hop, soul, funk, and jazz with the greatest of ease. The honey-drenched vocals of Steve Spacek grace “How Bout Us” while Stephanie McKay gets gritty on “Say What You Feel,” a throwback stomper deserving of the Stax or Daptone Records seal of approval. Each rapper involved brings something to the table, whether it’s the capable dexterity of fellow Australian Ru C.L. (“Step Up”), the introspective flow of the tragically underrated Diverse (“Dedicated”), or the mad-as-hell lyrical venom of J-Live (“Killing Ya Self”). 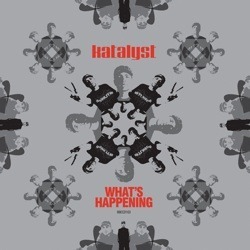 Katalyst rounds out the project with sure-footed rhythms and arrangement, as evidenced in the defiant “What Are We Talking About?” and the poignant, poetic reflections of “He Is Society.” What’s Happening may be a “right now” album topically, but it still maintains a musical timelessness.